This is my first mesh that's ready for upload! (still a novice at meshing really) It's sort of copied from this dress I saw at the Drac-in-a-box online clothing store. They have some pretty awesome clothes and I just HAD to try to make a mesh for the Renaissance Gal bodyshape. =] There's a fat morph AND a preg morph cause I really hate to change to maternity clothes most of the time. I used Gothplague's fetish ankle breaker shoes and Warlokk's poser magnets to make this. I have every expansion installed except Uni so I think this is compatible with all games, I'm just not sure. If it doesn't work let me know. Feel free to recolor my mesh or edit it if you wish just give credit or link back here. A great idea! This outfit looks really good on Ren-Gal. Thanks. Fantastic! That looks very beautiful. Thank you. Wow!!! I love new meshes! Thank you! yay!! 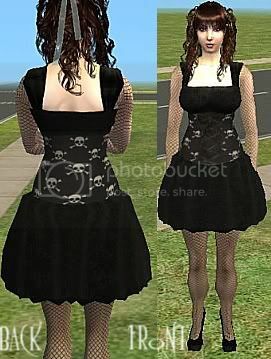 these are great, its so difficult to find pretty goth clothes for my pregnant simmies. thanks bunches.